I was traveling abroad during 1WkNoTech, so I used the fictional premise to document my time-travel to Merry Olde England in my effort to escape American high-tech life. 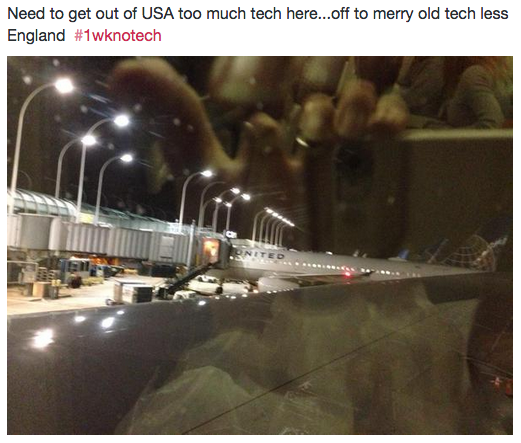 Text and images were posted to #1WkNoTech in Twitter. 1WkNoTech Participants included Rob Wittig, Mark C. Marino, Cathy Podeszwa, Jean Sramek, Davin Heckman, Talan Memmott, Jeff T. Johnson, Claire Donato, AND 161 members of the Facebook group; including Digital Media / Writing students of Mark C. Marino and Rob Wittig.